Inspired by ebird reports of a male Snowy Owl in Deerfield, we took a family visit down to Deerfield Meadows, just 20 minutes south of our home in Gill. We didn't see any other birders in the area so assumed we might be in the wrong place, but we hadn't been there long before Susannah casually mentioned "got one". 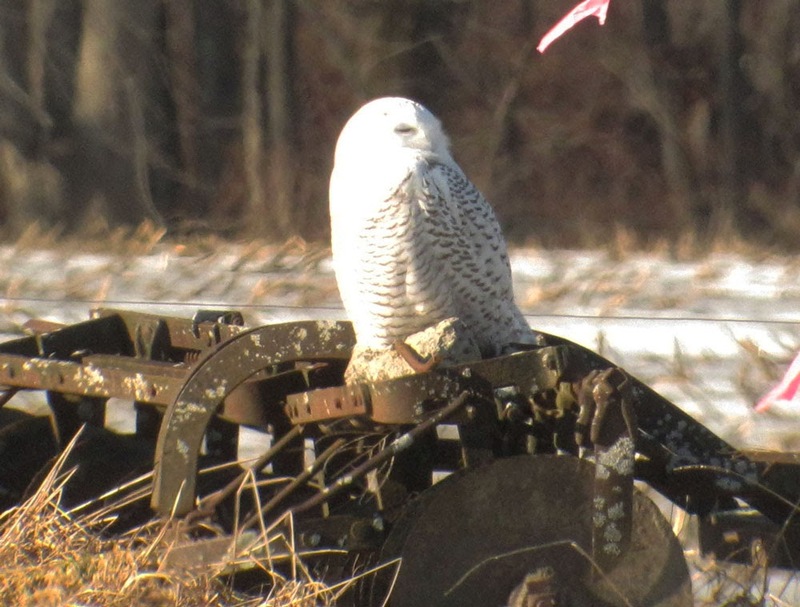 There sitting on a piece of rusty old farm machinery was my first Pioneer Valley Snowy Owl. Since it was quite heavily barred on the upper and underparts, I wasn't entirely sure if we were looking at the same bird referenced on ebird. 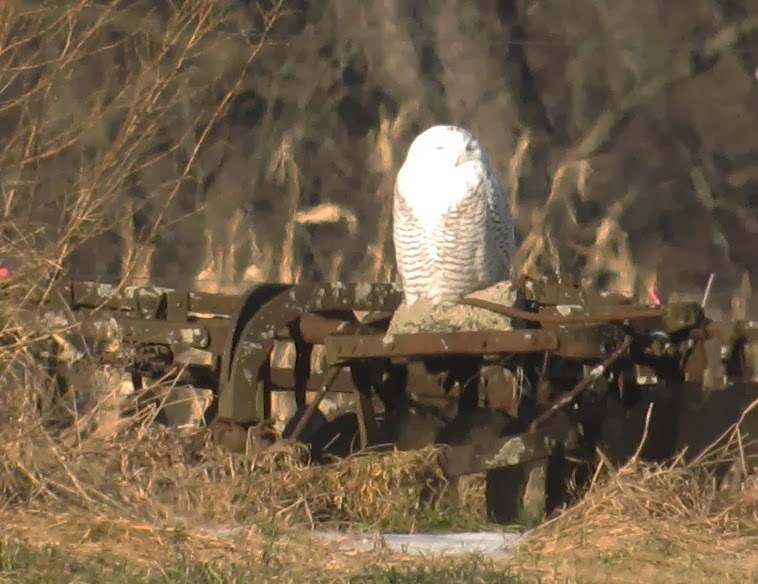 No matter, it sat seemingly content as we admired it for thirty minutes from a comfortable distance with a scope. What a stunner to see in "the valley". 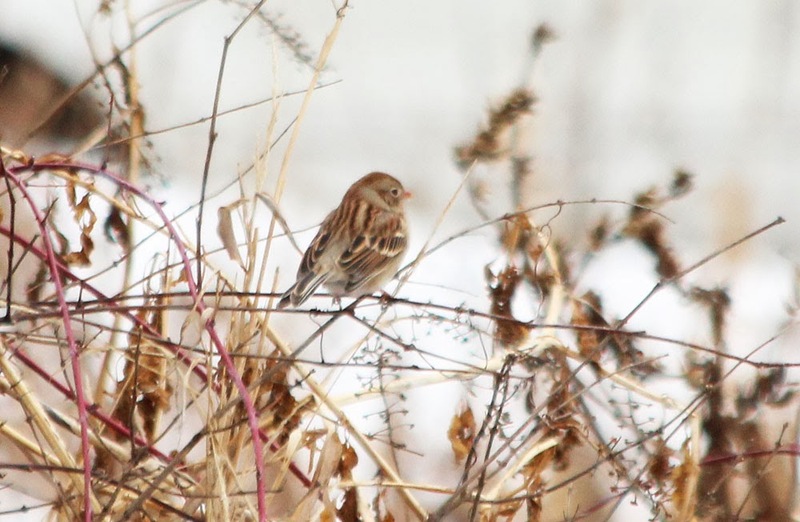 Yesterday I joined Josh Rose for his sector of the annual Greenfield Christmas Bird Count. It's becoming something of a tradition for Josh and I to get together for this and I believe this was the third successive year that we've joined forces. The areas covered included most the spots that I've come to regard as 'my patch' so it was no hardship at all to be out birding in my favorite local hot-spots. This year we were joined Lee Halasz and Joel Ralston, both new to the Pioneer Valley, and certainly first-timers for this count. 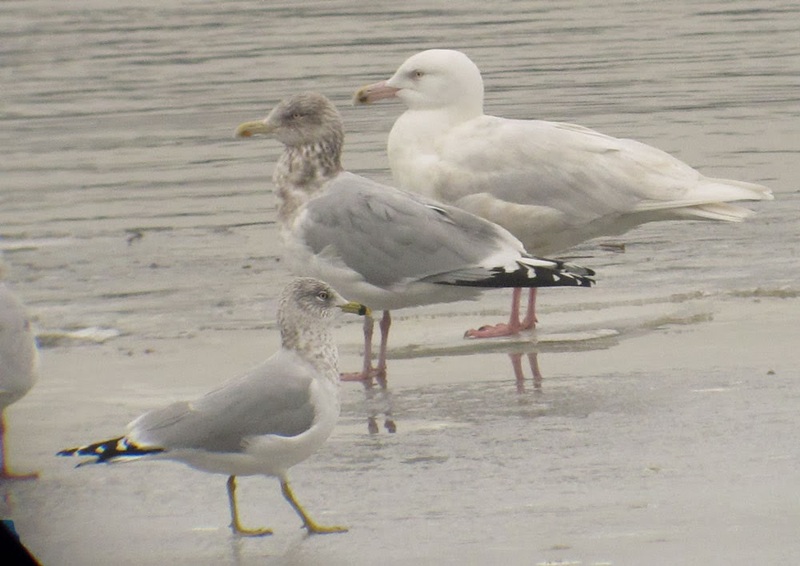 Glaucous Gull - 3rd-cycle (rear) with adult American Herring and adult Ring-billed Gulls, Unity Park, Turner's Falls, Franklin Co., MA. December 29th, 2013. One of three seen on our sector of the Greenfield CBC. Feeling restless, I was down on the power canal nice n' early and well before the rest of the team arrived. I had only limited success with owls with nothing for saw-whet or screech-owl, but a Barred Owl did emit a drawn out screech in response to saw-whet sound recordings. In the gloom of pre-dawn I was really surprised to see over 300 gulls roosting, or attempting to roost, on the flowing water of the power canal. 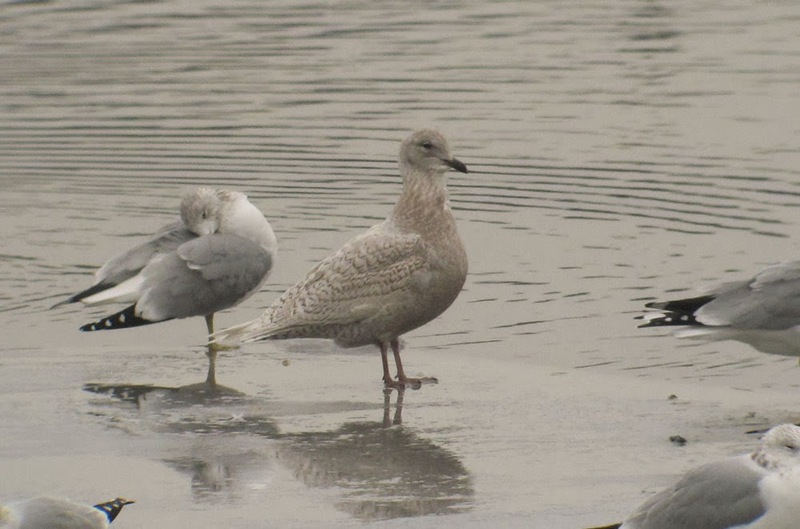 The first gull of interest that I noticed was a pristine adult Glaucous (wow!!) 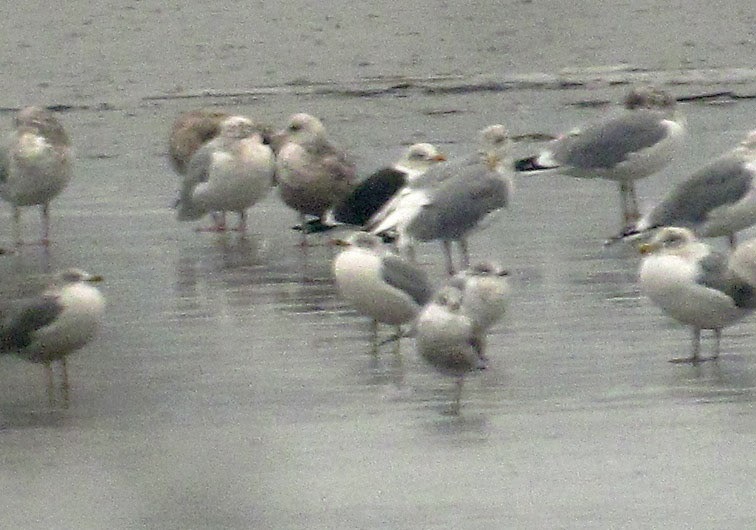 and subsequent searches produced more pale-winged gulls with two more Glaucous (3rd-cycle and 1st-cycle) and four Kumlien's (Iceland) Gulls, followed by an adult Lesser Black-backed Gull and another similar darker-mantled gull which looked better for a hybrid (Lesser BB x American Herring) to me. A fly-over Snow Bunting, a calling Pileated Woodpecker and a nice raft of Common Goldeneye and Common Mergansers rounded of a scintillating first hour, and all before I'd even met to the crew! Fortunately for the team, we caught up with most of the gulls later in the day when the afternoon became increasingly soggy, gloomy and fog-bound. Susannah and Matan quite sensibly joined us before the rain started and managed to contribute the only Belted Kingfisher of the entire day. We closed play at about 4pm, just after nailing a female-type Barrow's Goldeneye when it became almost to observe birds through our very wet optics. Glaucous Gull - 1st-cycle Turner's Falls power canal, Franklin Co., MA. December 29th, 2013.
but moved off toward Barton Cove to roost. 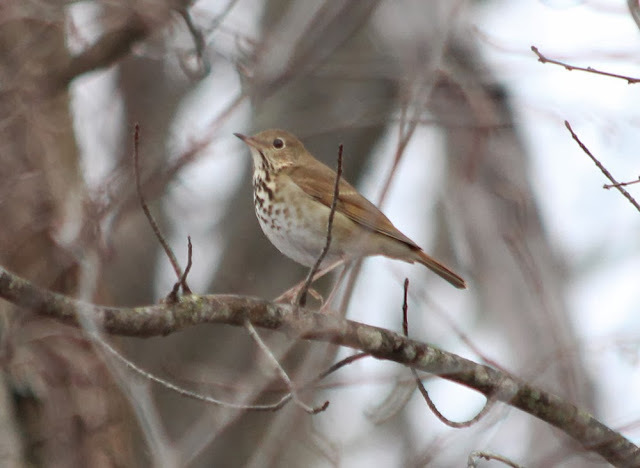 Hermit Thrush - powerline at Depot Road, Turner's Falls , Franklin Co., MA. December 29th, 2013. Field Sparrow - powerline at Depot Road, Turner's Falls , Franklin Co., MA. December 29th, 2013. We tallied about four of these, a very good showing for mid-winter. 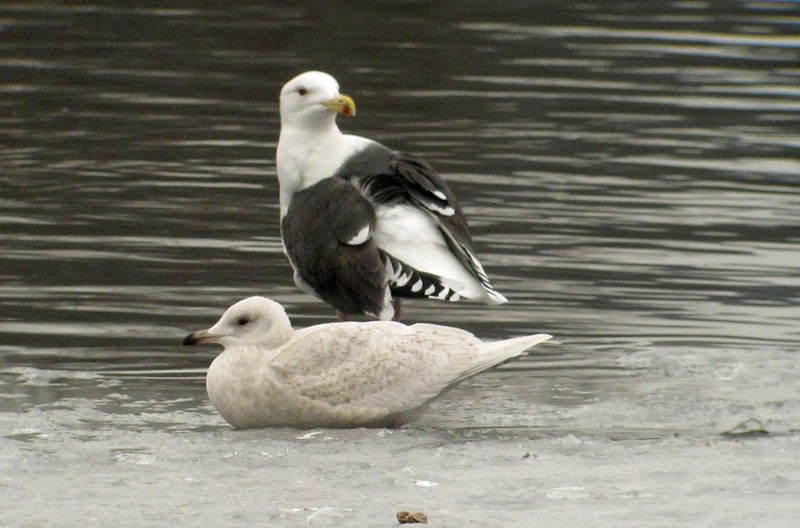 Kumlien's (Iceland) Gulls - 1st-cycle (upper) and 2nd-cycle (lower), Unity Park, Turner's Falls, Franklin Co., MA. December 29th, 2013. 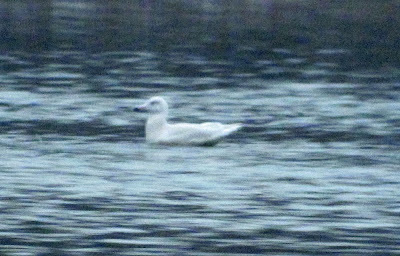 A truly outstanding day for 'Iceland' Gulls with four together on the power canal at dawn, up to two a Unity Park, two at the Greenfield Savings Bank in Turner's and the late discovery of a full adult on the power canal towards to end of the day. Five individual birds was our conservative tally for the day. Lesser Black-backed Gull - adult (center), Barton Cove, Gill/Turner's Falls, Franklin Co., MA. December 29th, 2013. 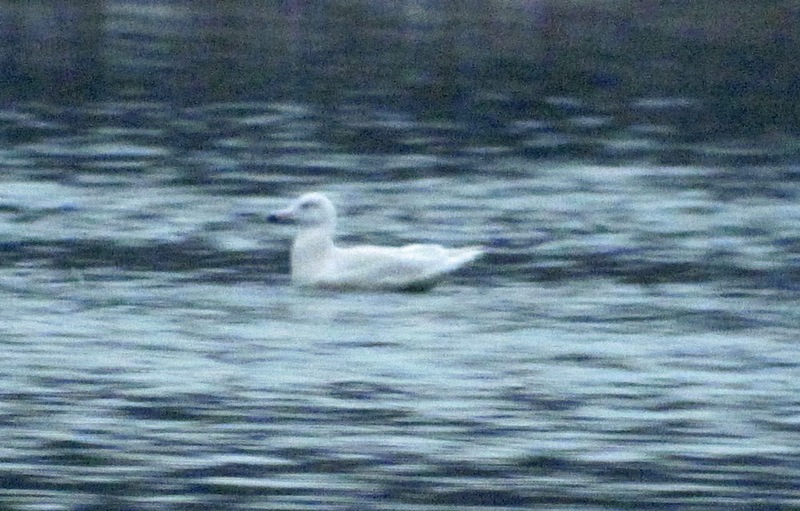 Found late in the day with the rain coming down hard, hence the dodgy record shot. Golden-crowned Kinglet - powerline at Depot Road, Turner's Falls , Franklin Co., MA. December 29th, 2013. Quite good numbers of these with birds on either side of the power canal. As with the previous two Greenfield counts with Josh, it turned out to be another massively enjoyable day with great company. Now I just need to shake the chills that I picked up late in the day after getting soaked through to the skin! On Christmas Eve we hooked up with some friends and met at Lot 1, Parker River NWR. Snowy Owls were very much the theme for the day and with reports of 16-17 from the previous day our the chances seemed very favorable indeed. In the event, it was a raw day with temps below freezing and a biting wind that chilled the atmosphere even further. Even so, seeing Snowy Owls wasn't too much of a problem and Susannah's sharp eyes soon picked out one from the boat ramp across from Lot 1. But getting close to them was a different can-of-worms altogether and most of the nine or so that we saw during the day were distant white 'lumps' way out in the saltmarsh. Fortunately, Susannah (again) spotted a closer one in the dunes, a bird which (luckily) was free of an audience and roosted peacefully in the dunes as we admired it with scopes from a comfortable distance. 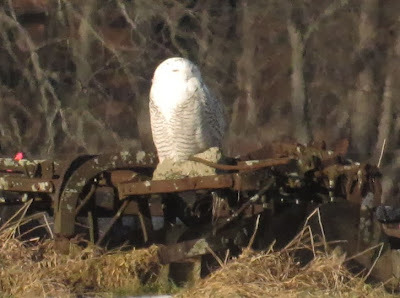 Snowy Owl - Parker River NWR, Essex Co., MA. December 24th, 2013. All images of the same individual taken using a Canon Powershot G10 through a Swarovski HD Scope. Other birds of interest during the day included a dark-morph Rough-legged Hawk (distant), a Merlin, a juvenile Bald Eagle, a Sharp-shinned Hawk and at least six Northern Harriers. Northern Harrier - Parker River NWR, Essex Co., MA. December 24th, 2013. Long-tailed Duck -male from the beach, Parker River NWR, Essex Co., MA. December 24th, 2013. Sanderling - from the beach, Parker River NWR, Essex Co., MA. December 24th, 2013. Snow Buntings - part of a flock of about 45, Parker River NWR, Essex Co., MA. December 24th, 2013. White-throated Sparrows - Gill yard, Franklin Co., MA. Decemeber 10th, 2013. Present daily in our yard with five-ten individuals present regularly. Fox Sparrow - Gill yard, Franklin Co., MA. Decemeber 10th, 2013. Slightly unexpected in December, this bird had a broken leg and spent December 8th - 18th visiting our feeders. It didn't appear on the 19th and I think may have succumbed after a series of extremely cold mid-December nights. American Tree Sparrow - Gill yard, Franklin Co., MA. Decemeber 10th, 2013. Another daily visitor to the yard, numbers fluctuate from two to fifteen individuals. Dark-eyed Junco - Gill yard, Franklin Co., MA. Decemeber 10th, 2013. The most common and frequent visitor to the feeders with up to twenty daily. 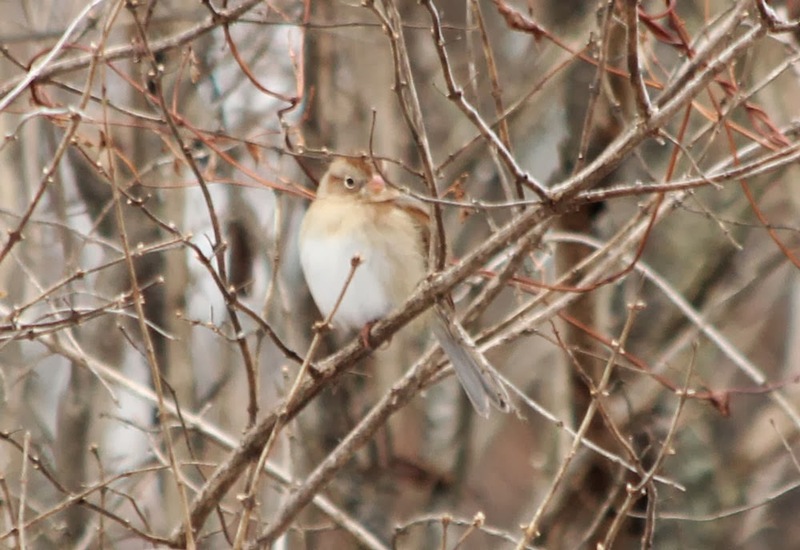 Photo-highlights from today's (12/21/13) Northampton Christmas Bird Count. As usual I joined Scott Surner for his sector of the CBC featuring the Hadley Honey Pot, Hadley Cove and North Hadley taking in various views along the Connecticut River. It was another hugely enjoyable day with Scott, beginning and ending in the Honey Pot with temperatures approaching a balmy 50 deg F by the end of the day - and the rain held off until the end of the count! 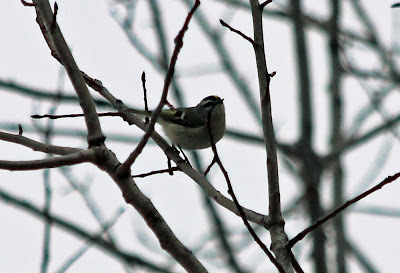 In addition to the photo-highlights below, we also found a Yellow-bellied Sapsucker, Winter Wren and Yellow-rumped Warbler finishing off the day in superb fashion with two Short-eared Owls hunting over the Honey Pot at dusk - not too shabby. Clay-colored Sparrow - Aqua Vitae Road, Hadley, Hampshire Co, MA. December 21st, 2013. Nice pick-up by Scott, ultimately approachable to within a few feet. Only my second on this count. Horned Larks - Aqua Vitae Road, Hadley, Hampshire Co, MA. December 21st, 2013. Lapland Longspurs - Hadley Honey Pot, Hampshire Co., MA. December 21st, 2013.
on the Aqua Vitae Road. On a personal level, the most I've had on this particular count. Ring-necked Duck - female/imm, North Hadley, Hampshire Co., MA December 21st, 2013. Another one found by Scott and I think my first on this count. Savannah Sparrow - Aqua Vitae Road, Hadley, Hampshire Co, MA. December 21st, 2013. A few weeks ago we had a short family visit to Plum Island hoping, perhaps, to enjoy a sample of the large numbers of Snowy Owls being reported there and elsewhere along the Atlantic Coast. In the event, we had no trouble at all in finding Snowies with two birds visible from the first parking lot almost as soon as we arrived. We went on to see a further three or four, though none were especially close. We had no such problem with this beautiful juvenile Northern Harrier which seemed oblivious to our presence as it hunted at close quarters near the parking lot at Sandy Point. All images from Plum Island, Essex Co., MA. December 8th, 2013. Snow Bunting - Turner's Falls airfield, Franklin Co., MA. December 19th, 2013. This morning I passed by Turner's Falls airfield stopping for an optimistic search for Snowy Owl. After a few completely bird-less minutes I decided to play a few bursts of Horned Lark song, again optimistically. Literally within seconds, a flock of about 60 Snow Buntings came charging across the runway and were soon swirling around my head before settling down in a hollow about thirty meters away. It happened so quickly that I wasn't fully prepared with the camera but fortunately the buntings continued to show (on and off) for the next fifteen minutes or so. I was really pleased with these as, aside from a couple of single fly-overs earlier this fall, it seems to have been a rather low-key fall and early winter for this species locally. Oddly, I couldn't find a single Horned Lark or Lapland Longspur among them. We had a relatively low key trip to Israel this November. Both common migrants and rarities seemed to be in very short supply but even so, we found a number of gems (as always) during our hard-working week. Highlights included a really good showing of Long-eared Owls and I continue to be impressed with the ease at which this fabulous species can be found in southern Israel. After stumbling across two roosting together in a remote wadi in the southern Arava, we enjoyed another roost of at least 17 birds at Kibbutz Gevulot in the western Negev. Nowadays, we only rarely miss this species on our Israel trips whether it be spring or late autumn. Kibbutz Gevulot, Western Negev, Israel. November 28th, 2013. Long-eared Owl - one of two roosting together in a remote Acacia wadi in the Hiyyon Plains, southern Arava. November 23rd, 2013.